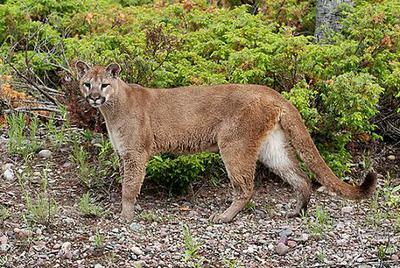 This is a Cougar - could this be what you saw? I was at school in St Catharines, and in our field I saw a very large cat. It was light brown/beige and very big. It was definitely not a house cat. I heard that Lynx have short tails, but this one had a long tail. Hello there - you didn't give us your name, and you didn't tell us exactly when you saw this big cat, and I'm not sure what this could be because Cougars shouldn't be in this area ..... but I did find a news report from July 22nd 2014, from the St Catharines Standard Newspaper, reporting that a Cougar had been seen near Welland, Ontario! Did it look like this Cougar picture I posted above? I have also posted this on our facebook page and perhaps someone there may know what you saw, so, feel free to check out our facebook page for more information about Southern Ontario. Please feel free to "like" and "share" while you're there! I saw what may have been a Cougar run up our front hill and across our barnyard area in late fall of 2013. I live in the farming/rural area between Cambridge and Brantford, Ontario. The animal had thick, muscular legs, a long tail, a dip or curve to it's back, and a cat-like shaped head. There have been plenty of sightings of Cougars in Niagara on the Lake. Especially at the bottom of the escarpment on Line 9 in the back of the farmers fields. I once saw a Cougar bolt in front of my car driving to Fort Erie. It was only about 10 ft in front of me and I have no doubt this was a Cougar. This sighting was roughly 15 years ago. Here is a news report of a big cat caught on a critter-cam in 2010 in the Wainfleet, Ontario!